Juniors thru Big League 90 ft. If a pitcher reaches a days of rest threshold or the pitch limit while facing a batter, the pitcher may finish pitching to that batter. The pitcher will only be required to the calendar day(s) threshhold reached while facing that batter, provided the pitcher is removed before delivering a pitch to another batter. A player who catches in any part of 4 or more innings in a game is not eligible to pitch that day. Minors, Majors, and Intermediate Divisions - A player may not pitch in more than one game in a day. Juniors & Seniors - A player may pitch in up to 2 games in one day only if the player threw 30 or fewer pitches in game one. Coaches, please use the pitcher eligibility forms and pitch count logs included in the coaching binder to track pitchers and present this to the opposing coach prior to each game to show any pitchers that can't pitch. Please see LL official rules for additional details. The primary goals of Baseball T-Ball are to have fun, to instruct children in the fundamentals of baseball, and to allow them to experience the value of teamwork. Fundamentals to be emphasized are hitting, base running, fielding, throwing and good sportsmanship. Games WILL start promptly at the designated starting time regardless of the numbers of players present. There are no forfeits in T-Ball as it is purely an instructional league. Players from one team may be "loaned" to the other to make up the deficit for either all, or part, of the game as needed. In order to keep the game flowing, coaches are expected to have their defensive rotation scripted prior to game time, and to have their catcher and players ready for the defensive half of the inning promptly after their own last batter is retired. A regulation game is 4 innings. No inning will begin after 1-Hour of playing time. If for any reason a game is not started at the designated starting time, coaches shall note the time of the first batted ball by the Visiting team, and this will serve as the start of the 1- Hour time limit. A new inning begins at the time when the last batter on the Home team 's roster is retired. All players on the roster will bat "through the line-up" and the order of batting in an individual game may not be changed once established. A side is retired when the offensive team has batted once through the line-up. When a batter hits into an out, or a base-runner is retired, that player shall be removed from the bases. The final batter of an inning will be announced to the defensive team. Unless the final batter hits into an out or a play on another base-runner results in an out, a side will be deemed retired when the catcher has possession of the ball and touches home plate regardless of the whereabouts of the batter or other base-runner(s). A batter who hits the ball into the outfield may continue to run until the outfielder throws the ball. Other base-runners may also advance until the fielder releases the ball. EXAMPLE: If the outfielder releases the ball just after a runner has rounded a base, that runner may continue on his way to only the next base. If, however, a runner is approaching a base at the time of release, the runner must stop at that base. The team at bat may have 1 coach assisting the batters at the tee and 2 other coaches positioned at 1st and 3rd base respectively. The defensive team may have 2 adult coaches in the field to assist with player positioning and advice. The primary goals of Baseball Junior Minors are to have fun, to instruct children in the fundamentals of baseball, and to allow them to experience the value of teamwork. Fundamentals to be emphasized are hitting, base running, fielding, throwing and good sportsmanship in preparation for eventual placement on a Minors Division team. Games WILL start promptly at the designated starting time. There is no "grace period". Any team showing less than 7 players at the designated starting time shall forfeit the game. Coaches should, however, play an unofficial game anyway, in which, for example, players from one team help make up the deficit of players for the other team. The forfeit still holds, though, no matter the outcome of this unofficial contest, even if a suitable number of players eventually do show up. Batter gets up to 6 pitches, no walks but player may strike out. If player fouls the last pitch they get another pitch, (they can foul off multiple times). Batter is out on pitch 6 or more if no swing. In order to keep the game flowing, coaches are expected to have their defensive rotation scripted prior to game time, and to have their catcher and players ready for the defensive half of the inning promptly after the third out of the inning is recorded. A regulation game is 6 innings. No inning will begin after 90 minutes of playing time has elapsed. If for any reason a game is not started at the designated starting time, coaches & umpires should note the time of the first pitch delivered to the Visiting team, and this will serve as the start of the 90 minute time limit. A new inning begins at the time the third out is registered for the Home team in any inning. In the event of a tie game during the regular season, the tie stands. All players on the roster will bat "through the line-up" and the order of batting in an individual game may not be changed once established. A side is retired at the conclusion of 3 outs or by batting through the entire roster. A team with fewer players in attendance shall bat the number of times equal to that of its opponent's roster size. EXAMPLE: Team A has 12 players and Team B has 10. Team B would bat once through its roster plus the next two batters to equal 12 in the inning. The distance between bases shall be 60 feet and the distance from the mound to the plate shall be 46 feet. Coaches will pitch to their own team and make every effort to throw overhand to all but the neediest of batters. There are no walks or free bases for batters hit by a pitch, however, a batter is retired after three strikes. The coach pitching may not field the ball except to receive it after a play is deemed dead, or upon return from the catcher. SUGGESTION: Coaches should throw hard enough so that they're not delivering sinkers, but soft enough that hitters won't back off the plate. REMINDER: All offensive players on the field of play shall wear a protective helmet, and no offensive player should have a bat in hand unless he is batting or on his way to/from home plate - no exceptions! A batter who hits the ball into the outfield may continue to run until the fielder throws the ball. Other base-runners may also advance until the fielder releases the ball. EXAMPLE: If the outfielder releases the ball just after a runner has rounded a base, that runner may continue on his way to only the next base. If, however, a runner is approaching a base at the time of release, the runner must stop at that base. No runners may steal bases or otherwise advance on a wild pitch or ball that gets by the catcher . Runners may advance no more than one base on any overthrow made during a play at any base. Further, if a batter simply runs through 1st base and mistakenly turns left WITHOUT making an obvious attempt to advance, he is not "fair game" and subject to being tagged out. If the batter DOES make a move toward second, he is fair game for a tag out. NOTE: Coaches should teach and drill on this in their practices. In addition to the coach pitching, the batting team may also have a coach near home plate, but not so close as to interfere with ongoing play, and two additional coaches positioned at 1st & 3rd respectively. The defensive team may have two coaches in the field to assist with player positioning and advice. A tenth defensive player may be positioned on the field as an extra outfielder only. All outfielders must be positioned on the outfield grass and no outfielder can step on a base to execute a force out -the ball must be thrown to an infielder covering the base. All defensive players must rotate positions at least every other inning, and substitutes must not sit out for more than two consecutive innings. NOTE: Catchers MUST be wearing a protective cup - NO EXCEPTIONS! The primary goals of Minors are to have fun, to instruct the children in the fundamentals of baseball, and to allow them to experience the value of teamwork. Fundamentals to be emphasized are hitting, base running, fielding of grounders & fly balls, throwing & pitching, and good sportsmanship in preparation for eventual selection to a Majors Division team. Games WILL start promptly at the designated starting time. There is no "grace period". Any team showing less than 7 players at the desig Select Allnated starting time shall forfeit the game. Coaches should, however, play an unofficial game anyway, in which, for example, players from one team help make up the deficit of players from the other team. The forfeit still holds, though, no matter the outcome of this unofficial contest, even if a suitable number of players eventually do show up. In order to keep the game flowing, coaches are expected to have their defensive rotation scripted prior to game time, and to have their catcher and players ready for the defensive half of the inning promptly after the third out of the inning is recorded. Coaches are allowed to catch for the pitcher's 8 warm-up tosses between innings ONLY IF the catcher was the batter or a base runner at the time the third out was recorded. A regulation game is 6 innings. On Saturdays only, no inning will begin after 90 minutes of playing time has elapsed, unless you are the final game of the day on that field. If for any reason a game is not started at the designated starting time, coaches & umpires should note the time of the first pitch delivered to the Visiting team, and this will serve as the start of the 90 minute time limit. For weeknight games throughout the season, no inning may begin after 8:15 PM. A new inning begins at the time the third out is registered for the Home team in any inning. In the event of a tie game during regular season, regardless of 6-inning limit, 90 minute time limit, or 8:15 PM curfew, the tie stands. All players on the roster will bat "through the line~up" and the order of batting in an individual game may not be changed once established. A side is retired at the conclusion of 3 outs, scoring 5 runs, or by batting through the entire roster, whichever comes first. A team with fewer players in attendance shall bat the number of times equal to that of its opponent's roster size. EXAMPLE: Team A has 10 players and Team B has 9. Team B would bat once through its roster plus one more batter to equal 10 in the inning. The distance between bases shall be 60 feet and the distance from the mound to the plate shall be 46 feet. REMINDER: All players SHOULD wear an athletic supporter and a supporter plus protective cup is MANDATORY for all catchers. Any offensive player on the field of play MUST wear a protective helmet, and no offensive player should have a bat in hand unless he is batting or on his way to/from home plate -no exceptions! Adult coaches can be stationed at 1st AND 3rd bases while their team are at bat. No defensive coaches are allowed on the field of play. If a batter simply runs through 1st base and mistakenly turns left WITHOUT making an obvious attempt to advance, he is not "fair game" and subject to being tagged out. If the batter DOES make an obvious move toward second, he is fair game for a tag out. NOTE: Coaches Should teach and drill on this in their practices. A batter who hits the ball into the outfield may continue to advance until the ball is controlled in the infield by a defensive player. Nine players take the field on defense and all 3 outfielders must be positioned on the outfield grass prior to each pitch. Further, no outfielder can step on a base to execute a force out -the ball must be thrown to an infielder covering the base. All defensive players must rotate positions at least every two innings and defensive substitutes must not sit out for more than two consecutive innings. For games played from April 26th to May 9th steals of all EXCEPT home plate (not even on a passed ball) will be allowed. There will be no advance on overthrows at any base. NOTE: These are Catcher development opportunities - encourage your catchers to throw to the base being stolen regardless of the runner's position as there is no penalty for an overthrow. For games played May 16th through the end of the season, all versions of stealing are allowed. This includes delayed steals of home resulting from a double steal or errant throws back to the pitcher. These games should be used to expose kids to all stealing rules as they are played in the District 9 Minors post-season. Runners may continue to attempt to advance one base for each overthrow. The primary goals of Majors are to have fun, to instruct the children in the fundamentals of baseball, and to allow them to experience the value of teamwork. Fundamentals to be emphasized are hitting, base running, fielding of grounders & fly balls, throwing & pitching, and good sportsmanship in preparation for eventual selection to a Juniors Division team. Games WILL start promptly at the designated starting time. There is no "grace period". Any team showing less than 7 players at the designated starting time shall forfeit the game. Coaches should, however, play an unofficial game anyway, in which, for example, players from one team help make up the deficit of players from the other team. The forfeit still holds, though, no matter the outcome of this unofficial contest, even if a suitable number of players eventually do show up. In order to keep the game flowing, coaches are expected to have their defensive rotation scripted prior to game time, and to have their players ready for the defensive half of the inning promptly after the third out of their offensive inning has been recorded. Coaches are allowed to catch for the pitcher's 8 warm-up tosses between innings ONLY IF the catcher was the batter or a base runner at the time the third out is recorded. A regulation game is 6 innings. However, the standard Little League mercy rules apply. A 10-run or more lead after the 4th inning ends the game. Also, second games of Saturday double-headers (when other games are to follow) will not start a new inning after 30 minutes prior to the next scheduled start time. The game will end at the completion of the current inning if the visiting team is winning, or immediately after the home team has the lead in the bottom half of the inning. All players on the roster will bat "through the line-up" and the order of batting in an individual game may not be changed once established. Batting team will continue through their roster until 3 outs are recorded. Adult coaches can be stationed at 1st AND 3rd bases while their team is at bat, as long as a third adult coach is present in the dugout. All defensive substitutes must not sit out for more than two consecutive innings. Pitching eligibility rules as provided for in the Little League "Playing Rules" Handbook and on your Pitching Log Sheets will be strictly enforced. 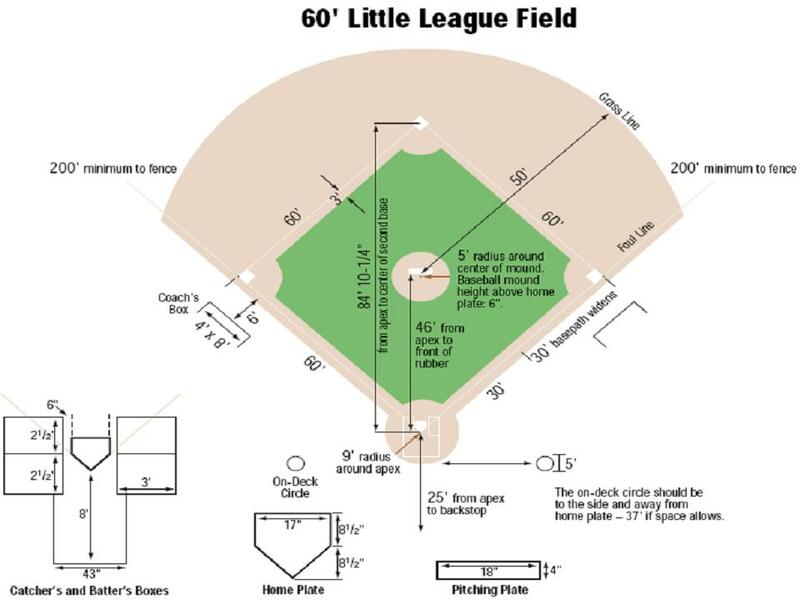 Possible additional Rockford Little League pitching rules may be established per Coaches discussion in order to provide more opportunities to develop a stronger pitching rotation for year-end District-9 Tournament play. Home team coaches are responsible for field preparation prior to the game and field maintenance after the game. All other rules not covered above are to be followed as written in the "Playing Rules" section of the Little League Handbook. The Handbook will be available with the handout of the uniforms. If you require further assistance, call Rockford Little League Vice-President of Baseball.